Jessying - Malaysia Beauty Blog - Skin Care reviews, Make Up reviews and latest beauty news in town! : Jessying's Birthday Giveaway ! When you read my blog, what is the one object (things/persons/animals) which reminds you of my blog and why ? Result to be announced soon! this is my entry as i promised! Go to my blog for answer! and character same as the Inspector Jacques Clouseau, to find out all the latested news/freebies for the reader.. 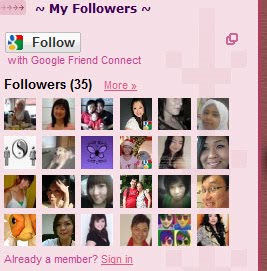 I am Pauline, my follower ID is Lavender, www.eveninglavender.blogspot.com & paulinecltan(at)gmail(dot)com. Your blog is very easy to identify because of the cute little cartoon girl and your picture in the black outfit of course! 1st of all, i know your blog is because you had left a comment in my blog... thanks for reading my story there. i miss my friend, every time when i pass the road, i will think of him. Hiya, hope you had a good bday. Here is my entry. Answered the question in my blog. But here it is also. The lovely heart and flower charms on your banners, together with that pink striped wallpaper which reminds me of the Christina Aguilera Candyman age. The Pink Little Girl just like My ‘Lovely Pet' and its always jumping around to gather the latest beauty info. My Life becomes meaningless without her !!! When I first came across this blog, the first thing it reminded me of was a Jack-in-a-box (a type of toy where a figure, usually a clown, leaps out when the top of the box is opened) - because of the title! !